A brand-new line of products today: Guerlain expanded their collection with a new range of skin cleansers. I'm so excited to finally show two of these to you, because I have been absolutely loving them. Guerlain selected the Nigellaflower for the Beauty Cleansers, symbol of perfection and serenity. This flower contains an antioxidant and anti-inflammatory ability. From the seeds of the wild flower there is Nigella-oil extracted, which was already part of Cleopatra and Nefertiti's beauty routine. The nigellaflower neutralizes the chemical oxidation reactions caused by pollution and UV-rays. By renewing gluthion, it decreases oxidation of the cells and the production of free radicals. The cel activity is reactivated and the skin can breathe again. 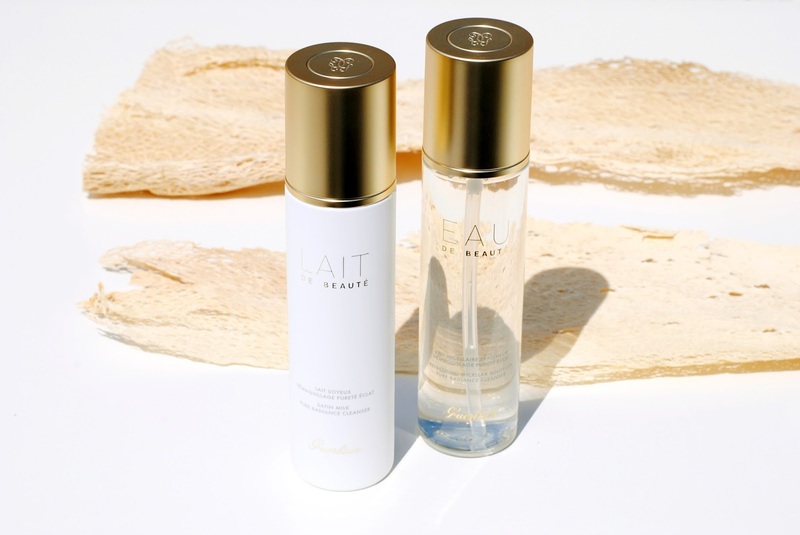 - L'Eau de Beauté: nice and light. - La Mousse de Beauté: full and airy. - Le Lait de Beauté: Soft and comfortable. - La Crème de Beauté: creamy and rich. - Beauté des Yeux: a protective and effective two-step formula. The packaging is absolutely my cup of tea. It's simple, yet has that luxurious touch with the gold details. These are one of those products that just look really fancy in your bathroom. The Lait de Beauté is also called Satin Milk or Pure Radiance Cleanser. I did not have any high hopes for this product because I hate milky make-up removers. They were always oily, leaving me with a sticky, shiny face. But this one is nothing like other Lait's, the texture is very light, and feels really good on my skin. My skin feels perfectly clean after using this, I use it very often now. Just like the Météorites collection, this line also has a signature scent. It's a subtle scent, a mix of white tea, some musk notes and a touch of jasmin. I prefer a scent in my products, and Guerlain always does this so well: just enough, not too much. I normally use the micellar water from Eucerin, but I was happy to try Guerlain's new one out. And it's good, it cleanses just as good as good as my favorite Eucerin, but I would go for Guerlain the next time because of the scent and packaging. Hey, the eye wants it part too! I used both products after my make-up wipes. Those wipes are handy for getting the make-up off, but they can not cleanse the skin. I normally only use a micellar water, now I use both. This combo is just divine. The Lait gets off make-up and rinses deeply, the micellar water rinses too, and it feels like the closure of the cleansing routine, very soothing. The Lait de Beauté surprised me. Normally I'm not a fan of milky cleansers, but this one is not sticky and I really enjoy using it. The Eau de Beauté is something you nééd. Everyone needs to have a bottle of micellar water. It cleanses so well that even after thoroughly purifying your face, your cotton pad with micellar water still will turn a bit grey. It's the best thing when it comes to cleansing. I have discovered something these last days. I think Guerlain might be my all time favorite beauty brand... I am really enthusiast about these two cleansers and I got a peek at a new collection that is coming in a few weeks, and I have to say: Guerlain never disappoints. Which cleansers do you use? It looks really good! I love the gold details, it makes it so fancy! love guerlain and I need to try this products!!! Ah hoe fijn! Ik ben echt een reinig-freak, en deze klinken enorm goed! Qua verpakking moet Guerlain nooit onderdoen :-) Ik ben nogal hooked aan mijn Philosophy Purity (toch voor 's avonds, om mijn make-up te verwijderen) en qua micellaire reiniger switch ik vaak en probeer ik verschillende merken uit.